It is common knowledge that exercise and diet are needed if you want weight loss. Many find that diet is even more important than exercise to get the best results. One reason is: it’s easier to control your caloric intake than the amount of work you can do to burn them. Many people have long wondered whether drinking hot water helps you lose weight. There are a lot of different pieces of advice on diet to be found and some is nonsense, at best. Consider some of the truth behind drinking hot water and losing weight. Though, ‘eating less and moving more’ sounds simple, we all know weight loss takes a great deal more to achieve. Because of this, there are many fables about what works and what doesn’t when you want to drop a few pounds. One thing that often comes up is losing weight by drinking hot water. The theory behind this is that your body will burn calories in order to bring the water down to the core body temperature to be able to absorb it. This is supposed to also boost your metabolism as well. In fact, your body may expend 10 calories when it digests 100, but you won’t see much burned in absorbing water, regardless of the temperatures. Drinking hot water also won’t boost your metabolism. It is more your age, size, genetics and gender that influence it. Does drinking hot water help you lose weight? The truth is, hot water may have a leg up on cold water in aiding with weight loss. This is because hot water stays in your stomach longer. This means a cup of hot water will help you feel full longer than a cup of cold water. It can be helpful to avoid snacking, but there isn’t much research backing up how useful it is. If you find warm water, or drinking hot tea helps you stop snacking, this may be the right diet strategy for you. Beverages account for a large portion of calories in your diet; this means any time you can replace one with water it’s a good thing. Drinking more water, whether cold or otherwise, is a good step in the direction of weight loss. Not only can it slow down your liquid calorie intake, it can help you consume less at mealtimes. Many find that drinking a full glass of water about a half hour before eating can be a boost to weight loss. In fact, one study performed in 2015 showed those who drink a glass of water before a meal ate about 40 calories less than those who did not. The first, and best way to get water in is to drink it. If you need some taste and ways to change it up, remember you can try some infused sparkling water. Others like to squeeze fresh lemon in their cold or hot water. Don’t forget to try cucumber slices and mint leaves, as well as fresh ginger peels. There are some studies that show carbonated or sparkling water may also have weight loss benefits. Again, this has to do with the carbonation helping you feel full. 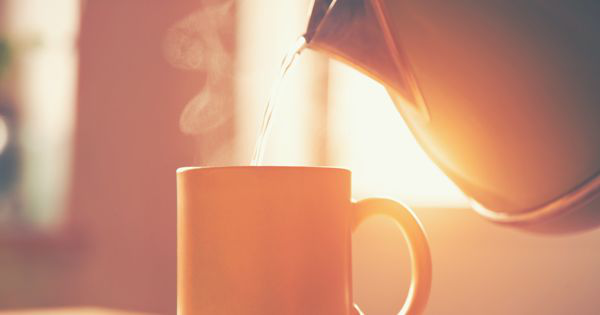 Does drinking hot water help you lose weight? Maybe, but it is not likely to have a great effect. If you do wanna try hot water, remember the tips. 1. For the best results, drink your water at 50-degree C as soon as you wake. 2. Take your time and spend a minimum of ten minutes enjoying it. At the same time, be cautioned you don’t need to drink it so fast you burn yourself. 3. Drinking hot water when you first wake and before and after a bath is beneficial to weight loss. Drinking warm water before your bath has been noted to lower blood pressure. It can also help the circulatory system while providing warmth from the inside out. 4. You don’t need to overdue it either, a target goal might about five cups in a day. 5. One of the best tips for using hot water to achieve weight loss is to cut down on carbs and sugars. You can’t expect water to do it all alone, try reducing some of the junk or fattening foods you are eating, and you’ll see faster success.